This week, the Splitcoaststampers featured stamper is my friend Bonnie! How exciting - it's so fun to know someone famous! I chose this one-layer card of Bonnie's, from back in 2010. 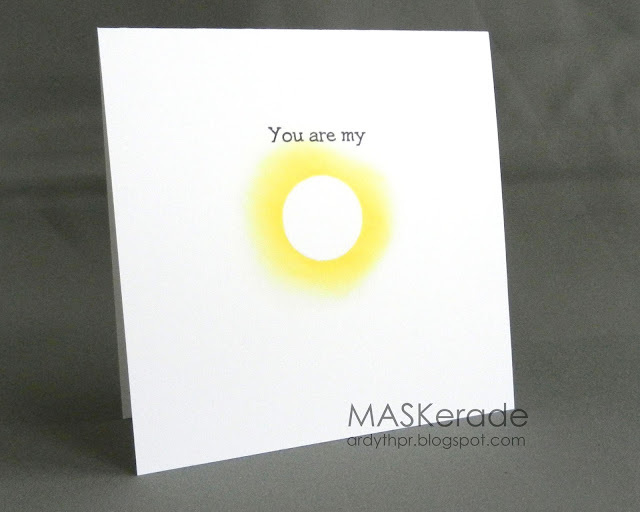 I simply masked a circle and sponged some yellow ink around it to create my sun. Then I stamped the Our Craft Lounge sentiment in black. Congratulations, Bonnie - enjoy your week as the FS! Ardyth you create such rockin' cards! Love this. You've made such an "Ardyth" tribute card for sweet Bonnie! She will love it!! What a fab card Ardyth, very you! Oh, Ardyth, I DO LOVE IT in all it's sunny goodness! Thanks so much and I'm so glad you're spreading sunshine! Wow...this is simply amazing. Love your son, so bright. Oh wow, this is so pretty! I love it in place of the word too - cute! Thanks for choosing my card in the CASology gallery! Awesome! Totally makes me think of a warm, hazy summer's day!